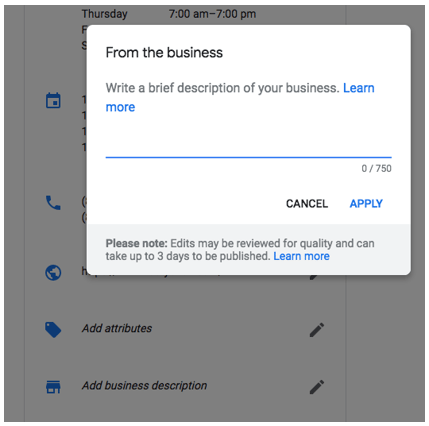 ADDING BUSINESS DESCRIPTION ON GOOGLE MY BUSINESS IS NOW HASSLE FREE! Login to Google My business. Click on the info button on the menu bar. Click on the pencil icon and add info. PSA from Website Hosting Canada Leader HostedinCanada.com on Google Reviews! To help you get more reviews for your business, we highly recommend our review widget. 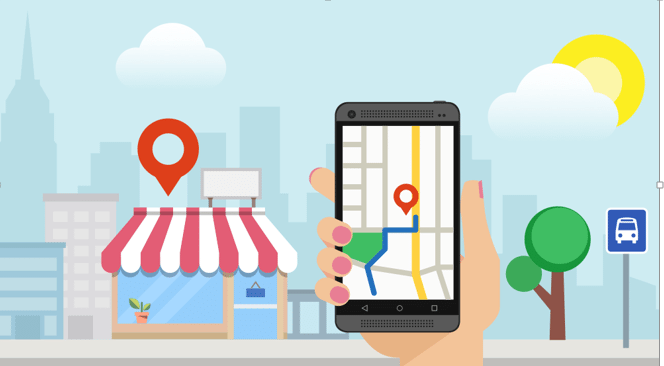 It’s a small piece of code which is placed on your website and helps you get positive reviews on Google, Yelp and Facebook. In addition, it helps to filter out negative reviews too thus ensuring a positive experience for website users. Need more details? Please connect with us. Canadian Web Hosting Sites Need to replace SSL/TLS Certs by Symantec, Thawte, VeriSign, GeoTrust and more Immediately! PSA: Canadian Web Hosting Sites Need to replace Your SSL/TLS Certs by Symantec, Thawte, VeriSign, Equifax, GeoTrust and RapidSSL Immediately! CALGARY, ALBERTA, CANADA, March 22, 2018 /EINPresswire.com/ — This is a PSA (public service announcement) by HostedinCanada.com, a leading Canadian Web Hosting provider. This is a reminder to all website owners. Google’s Chrome browser, which currently makes up 77.9% of browsers used on the internet, and has grown almost every year since 2008, starting at 3.1%, has already started the process of ending support for Symantec SSL/TLS certificates. This includes companies owned by Symantec including Thawte, Verisign, Equifax, GeoTrust and RapidSSL. • The ‘Canary’ release already ended support for these certificates. It was released on January 20th, 2018. • The Beta release for Chrome 66 will be released on March 15th. • The Stable release for Chrome 66 will be released on April 17th. If you are running a Symantec certificate issued before June 1, 2016, and you do not replace that certificate, then from April 17th onwards this is what your site will look like to site visitors (See Image). As you can clearly see, the error is described as NET::ERR_CERT_SYMANTEC_LEGACY, meaning that your website is using a legacy Symantec certificate that is no longer supported. Starting with Google Chrome version 70, all remaining Symantec certificates will completely stop working, including those issued after June 1, 2016. Chrome 70’s release schedule for Canary, Beta and Stable is July 20th, September 13th and October 16th respectively. If your website has an issue, the page should give you a warning. Make sure you just enter the hostname and remove the https:// prefix and the ending slash. If you need assistance contact HostedinCanada.com toll-free from anywhere in North America at 1-866-730-2040, as they can help you transition to a supported SSL Certificate. If you host with them they will provide a FREE SSL Certificate for a limited time. (Use Code FREESSLMARCH if ordering or switching to HostedinCanada.com) Also, please help spread the word. If you know anyone else who owns a website share this message, so they are not caught by surprise when this change goes live next month. Page speed is crucial. Most of the results were from fast loading pages. Domain authority is of absolute importance. Content that ranks well on the desktop also ranks well on voice search. Surprisingly, Schema is not that important factor as only 36% of sites that ranked well on voice search results were using schema. 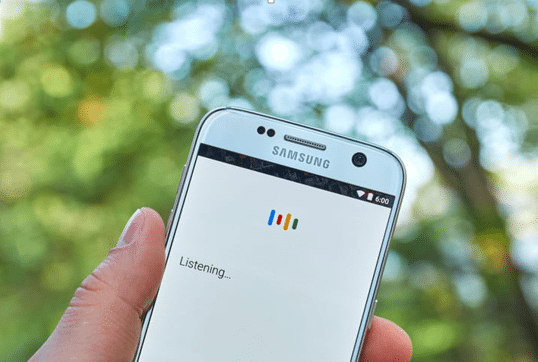 41% of Voice search results came from featured snippets. 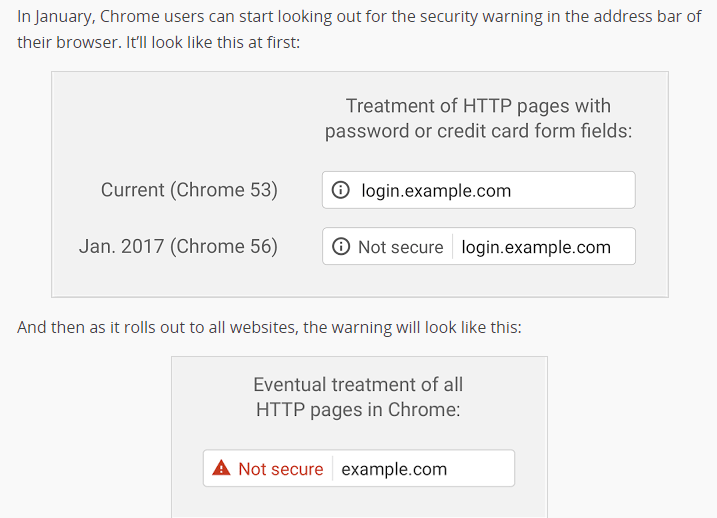 HTTPS is an absolute must. A successful WordPress website offers its audience two benefits – great, useful content, and an amazing browsing experience. The latter heavily depends on the web hosting service. So, choosing a web host is one of the most important decisions for a website owner, especially because there are numerous providers that offer WordPress hosting in Canada. The web host’s bandwidth, reliability, and value-added services allow the websites to provide their audience with a smooth and memorable experience. This is possible when your Canadian web hosting service offers phenomenal customer support, its services are easy to use even for a non-tech person, and offer plenty of add-ons that’ll give you full flexibility with regards to your website. Those are the primary considerations you should focus on when choosing your web hosting service. 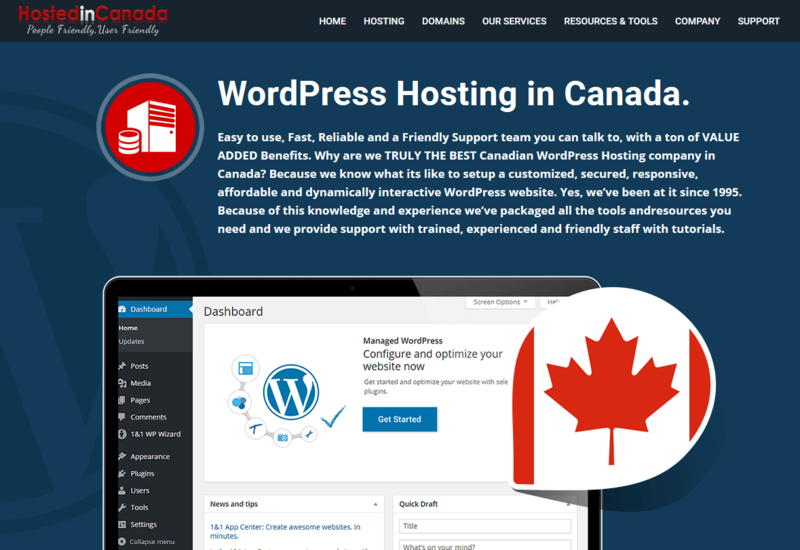 HostedInCanada has designed special plans for WordPress hosting in Canada. Website owners get a plethora of features, add-ons, and benefits that are uniquely geared to provide their WordPress websites with an exceptional hosting experience. 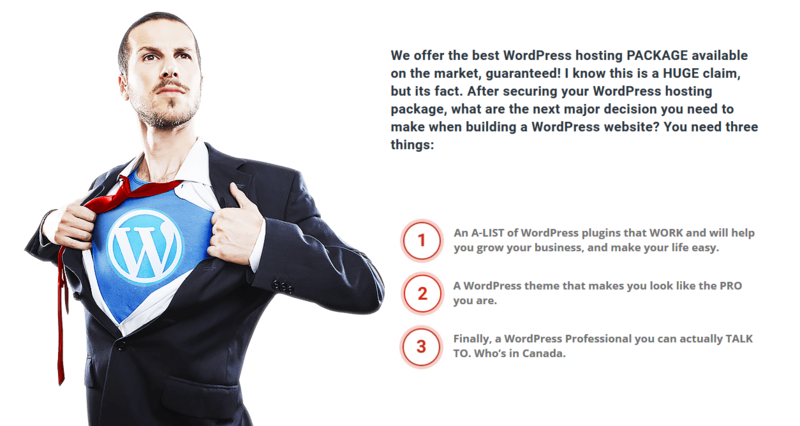 Here’s how to Buy WordPress hosting in Canada. Step 1: Select Your WordPress Hosting Package here. HostedInCanada offers 3 hosting plans for WordPress websites, and each of them comes with its own sets of features. Choose the plan that gives you the best value for money. Whichever plan you choose, you get full access to the amazing customer support at HostedInCanada, which is the most important factor when choosing a Canadian hosting service. HostedInCanada offers you 3 options when it comes to your domain name. You can buy a new domain, transfer your existing domain to HostedInCanada, or continue using your existing domain as well as the existing domain registrar by updating the name-servers of HostedInCanada with your domain registrar. Once you have made your selection, you will be taken to the next page. In this step, you can configure your hosting package. You can select your billing cycle, choose add-on services, and review the order summary one last time. In this step, you configure your domain to redirect it to HostedInCanada’s web hosting servers. So, if you are buying a new domain from HostedInCanada, then this step will not pop up in your hosting purchase process as it will be done automatically for you. If you are using a pre-existing domain, then you will need to share the EPP code generated from your existing hosting service with HostedInCanada. Then you can proceed to the next step, which is Checkout. On this page, you’ll share your contact details, your billing details, and your payment details. You can make the payments using your credit card or PayPal. And that’s it. You’ve purchased your WordPress hosting in Canada, and possibly a new DYNAMIC domain name. The entire process will hardly take a few minutes and you will be done even before you know it. Keep in mind HostedinCanada.com offers lots of options and promotions for the next step, building and marketing your WordPress website. The amazing part is you can actually TALK TO our team, before and after each stage of the ordering. Don’t believe me? After your order, call HostedinCanada.com and ask them about getting a FREE WordPress theme. Quote code 2018hic232 and see what you get. If you ordered there WordPress Enhanced or Enterprise package, you will be eligible to have your WordPress Website build for you at 25% off the incredible package price they have for their starter WordPress website package. That’s what ease of use means, and that’s why you should choose HostedInCanada for your WordPress hosting needs. 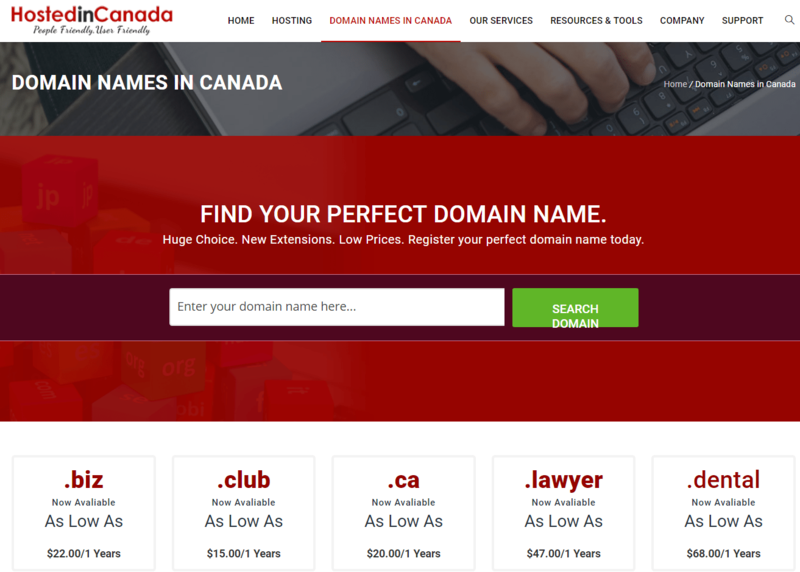 What is and where can I get domain name registration in Canada? Domain name registration in Canada with HostedinCanada.com is the process of reserving a name on the Internet, usually one year but with most domains, you can register up to 10 years. Keep in mind that once you register a domain it will remain yours for as long as you renew it and there is no way to purchase a domain name forever. Domain name registration is required for a website, an email or another web service(s). Also, you don’t have to always register a new domain name. Many companies allow you to use subdomains of their domain names for a website, or you can have an email with their primary domain (ex. yahoo.com, gmail.com, telus.com). most domain registrations companies now offer the ability to hide this information for a fee. The price for a domain name registration varies greatly on its extension and with over 1000 TLD’s (Top Level Domains) available you have lots to choose from. A sample and most common is .com, one of the most affordable ones. Also, you can reserve country-specific, like .ca for Canada. But they are usually a little more expensive. If you’d like to register a domain name with HostedinCanada.com, please go here and do a search. For detailed information about domain name prices and how to get one FREE for LIFE, please contact our Customer Care via phone or chat. CALGARY, ALBERTA, CANADA, January 17, 2018 /EINPresswire.com/ — When considering web hosting Canada options, there are many things for a smart business owner to consider. High on the list, including reliability, speed, price and how well the host can handle demanding traffic. Fortunately, the decision doesn’t have to be a difficult one. Leading website hosting Canada company, Web Hosting in Canada, take all of these issues extremely seriously and have built their well respected, growing business around answering them all reliably, professionally and with first class service. It’s not a surprise they are the first choice for Canadian businesses in-the-know. Hosted in Canada are responding to one of their most frequent client requests by offering free WordPress tutorials, with every WordPress website. TORONTO, ONTARIO, CANADA, January 22, 2018 /EINPresswire.com/ — Hosted in Canada are responding to one of their most frequent client requests by offering free WordPress tutorials, with every WordPress website. Canadian Web Hosting company HostedinCanada offer current News and Updates for Canadian’s. WordPress PAGE SPEED WILL BE OFFICIALLY a GOOGLE RANKING FACTOR, STARTING JULY 2018. Get 15% off setup of your site now. How to buy WordPress Hosting in Canada and save 25% on your first website!